This volume includes reprints “The Chess Players”, originally from the October 1953 issue of The Magazine of Fantasy and Science Fiction. The story of Zeno the Rat by Charles Harness faithfully recreates the small chess club atmosphere of 60 years ago. I’ve always loved the story, but interestingly enough, more readers wrote in to complain about it taking room away from chess, than not. Another treat is the complete coverage of Hollywood 1954 (or the 2nd Pan-American Chess Congress) won by Arthur Bisguier over Larry Evans. The cross table reads like a who’s who of early 1950’s California chess. This is one volume not to be missed! Pre-WW2 had only intermittent chess magazine coverage for Northern and Southern California; the war years had none. In 1947 George Koltanowski moved to Santa Rosa, California, and started the California Chess News. In 1949, California Chess News changed its name to Chess Digest and lasted through 1950. The first issue of the California Chess Reporter, that promised continuous coverage of the entire state, appeared on June 1951. Editor Dr. H. J. Ralston’s first editorial explained it best, “The unhappy demise of the Chess Digest early this year left the chess players of California without any organ for the systematic publication of chess news. It has been the fate of chess publications in the past to quietly expire unless they enjoyed the support of some solid organization of chess players. Besides Editor Dr. Ralston, the CCR boasted Associate Editors, Guthrie McClain (SF), Neil T. Austin (Sacramento), Francis Crofut (San Jose), and Dr. Mark Eudey (Berkeley). Chess historians and collectors consider the Chess Reporter the gold standard for California chess magazines. 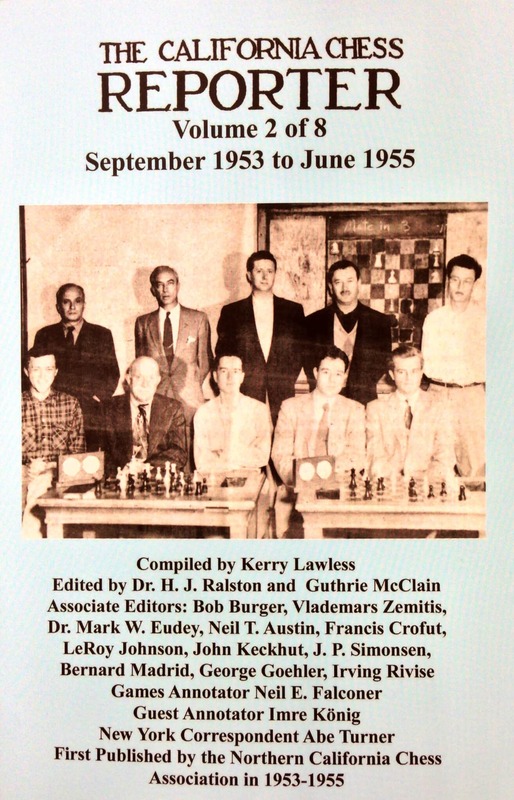 There have been over a hundred chess periodicals to have graced California chess during the last one hundred years, but only one has combined all the pertinent information that a chess historian looks for: who played in what tournament, club or league, when and where it was played, and, of course, the game scores. The match results, club results, league results, tournament cross tables, and game scores that appeared every month for both Northern and Southern California answered all of these criteria and more. The Reporter had very balanced reporting; there were first hand accounts from tournaments, articles on opening and endgame analysis, problems (yes, Virginia, in those days there really were players who liked to solve them), and even an occasional fiction story (Zeno the rat was terrific!) The off-set process that the Reporter adopted created very readable chess diagrams and excellent photos.